Data breaches and hacking threats are undeniably one of the biggest problems in the business world today. This has lead to considerable efforts in the development of cyber security solutions, be it hardware, software or consulting services. The increased demand for cyber security makes investing in the space a lucrative opportunity for venture capitalists and those interested in thematic investing. Like with other investments, investors want to do your research before jumping in. 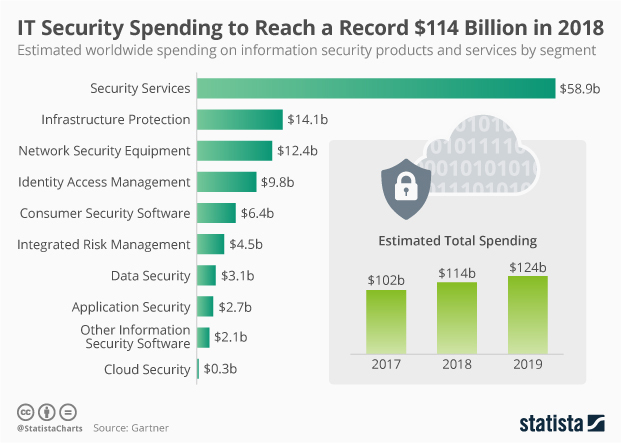 Cyber security spending is expected to reach a record $114 billion this year and forecasted to hit $165.2 billion by 2023. Experts expect it to grow at a compound annual growth rate (CAGR) of 10.7 percent. Nearly every company that gets hacked usually bolsters their security following a breach. This ensures a constant need for advanced solutions that will deter future attacks. Assessing the market based on existing market indicators and prospects will help you understand why it’s worth it to invest in cyber security. Investing in cyber security has its own fair share of risks too. A factor to take into consideration is how companies stack up with their competition. Staying informed on the top players in the cyber security space – their commonalities and differentiators – may help ensure you’re holding the most valuable option for your portfolio. It’s also important to monitor whether clients of the cyber security companies in which you’re investing are experiencing data breaches. Cyber attacks are bound to happen, and if they are successful in causing a data breach for one of the companies in question, this can play out poorly for the shares of the security firm if they’re at fault. The Evolve Cyber Security ETF (CYBR) provides portfolio rebalancing on a quarterly basis and is the only Canadian ETF that invests primarily in equity securities of global companies involved in the cyber security industry. Determining the top performers in the cyber security services industry is key for making an informed investment in the space. A good example is Palo Alto Networks (NYSE: PANW). This company is known for its next-generation firewalls that power over 30,000 companies and their customers. The company’s revenue is expected to grow by 23 percent in 2018. CyberArk (NASDAQ: CYBR) is also a notable player to consider in your cyber security investment portfolio. The company helps to protect companies from internal threats, such as spies and disgruntled employees. Fortinet (NASDAQ: FTNT) is known for its application controls, firewalls, and anti-malware services. It has a broad range of services to meet the needs of both small and large organizations. An ETF may provide a diversified approach, with exposure to a number of cyber security companies including those named above. This approach helps you avoid risks associated with single stock selection. A cyber security ETF can also be seen as a diversifier within the technology sector, as it provides exposure to securities outside of the traditional social media and/or software, hardware manufacturing bucket. As the threat of cyber attacks is increasing, cyber security companies are on the frontline of defence. This means constantly developing new technologies to help their clients prevent internal and external threats. This consistent growth makes the sector a viable opportunity for investors who want to diversify their portfolio. If you are interested in thematic investments, please speak with your financial advisor or visit the Evolve ETFs website to learn more.